YAY for outdoor shoe picks! 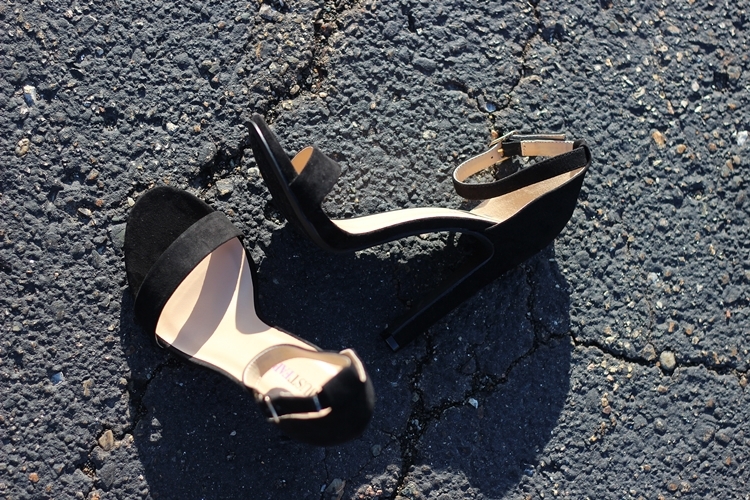 Loving today's weather which was perfect for these single soled, ankle straps here from JustFab. Let me tell you a little story on how these lovelies became a fixture in my closet. If you aren't aware, I'm going to be debuting my own link up next week Monday, and while styling the outfit for that post, I couldn't find a shoe that I liked with it (story of my life lately). These were in my wishlist at JustFab, so I just decided to pull the trigger and the rest is history! There are so many variations of the infamous single soled sandal right now and within every price range! It's good to be able to rely on online shopping to fulfill that instant and almost impatient need (Thanks JustFab!). Here are a few more before we dig into everything Kati! Like stated above, the beauties are called Kati and they couldn't be more perfect! I've always shied away from shoes like these because of my narrow feet slipping completely out of them, but I believe with the thicker strap across the toe and the fabric that it's constructed from, my feet don't move! The thicker shaft on the heel make for easy stepping and even though they are 4.5" w/no platform (yikes), they are surprisingly comfortable! Geez, I'm in total love with these babies! "Add a touch of sophistication to any style with Kati. She features a trendy ankle strap paired with a breezy open toe. Kati is a closet staple for any fashionista. Faux Leather." I certainly can't wait to rock these babies and don't worry, you'll see them in action next week!! If you are loving these as much as I, head over to JustFab and scoop them up! They are avail in 4 different colors, whiskey, which is brown, orange, denim, which are next on my list and the black, which are almost sold out! Happy Hump Day Loves ♥ Hope you're having a fantastic week! I'm going to be starting a blog link-up every Monday called Let's Make Today FABULOUS starting on April 4th! My first theme will be Overalls! I am super excited and I hope to see you guys there! Make sure you're following Birth of a Fashion Blogger to catch the reminders! If you are interested in co-hosting, email me at info@mschanda.com!